England came from behind to win 5-1 against Montenegro in Podgorica with Ross Barkley scoring twice. Michael Keane, Harry Kane and Raheem Sterling also scored as England made it two wins from two in Euro 2020 qualifying on a night when Gareth Southgate gave full debuts to Callum Hudson-Odoi and Declan Rice. The goalkeeper had to wait until the 15th minute of the match for his first touch and found himself picking the ball out of the net soon after that. However, there was little that Pickford could do to keep that one out and he did well to pluck a cross out of the air later in the half. All in all, this wasn't his busiest night so it will grate that there was no clean sheet. The Manchester City defender often came inside to get involved in the build-up and left the winger ahead of him to get on with the attacking duties. It was a more restrained role for the sometimes marauding full-back but he did it well enough, providing some much-needed cover when Montenegro attempted to break on England in the second half. Having been partially to blame for the Montenegro goal, Keane popped up in the other penalty box to head in the equaliser. The centre-back appeared to make it too easy for Marko Vesovic to nutmeg him and that will be a concern, but there is no doubting his character and he will feel an awful lot better for having bounced back from that disappointment to score. Maguire is now the senior centre-back in this England defence and he appears to be embracing the role with a typically strong display. Not all of his passes found their target but he was committed to playing out from the back, put in some heavy challenges, and was his robust self in the air. Given his chance ahead of Ben Chilwell, Rose got forward well in the first half and put in more tackles than any other England player in that opening 45 minutes. Unfortunately for the Tottenham left-back, his sloppiness in giving the ball away inside his own box was one of the more memorable moments in an otherwise solid effort. Alli almost latched onto Raheem Sterling's right-wing cross with one of his trademark runs into the box when the game was still goalless, but this was one of his quieter evenings for England. Once again expected to take on more defensive responsibility with Barkley alongside him in midfield, he got through plenty of work before being withdrawn just after the hour mark. Rice was tidiness personified on his full England debut, taking a no-risk approach with his distribution throughout. That's what's needed in that holding midfield role, of course, and the 20-year-old West Ham man did a mature job of protecting the back four. This was a potentially tricky assignment for him and he came through the test well. Barkley was the man of the match. It was his inviting right-wing cross that found the head of Keane for the equaliser and he was in the box to deflect Hudson-Odoi's shot into the net for England's second. After the interval, he added his second goal to make it 3-1 and sliced open the defence for the fourth. This was, by some distance, his best game for England. 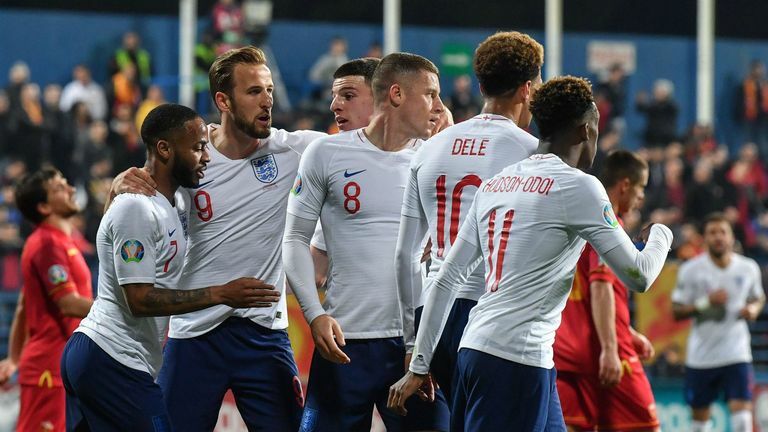 On the night that he became the second youngest player to start a competitive game for England, Hudson-Odoi looked right at home. In fact, he was a joy to watch, proving particularly effective once he was switched to the left flank. It was from there that he cut inside to provide an assist for Barkley's first goal. What an exciting prospect he looks. The England captain is asked to play a selfless role in this team, drawing defenders away from the talented wingers either side of him, and such is Kane's adaptability that he is very good at it. There weren't too many touches of the ball but he was involved in the build-up to the second goal and then stroked home the fourth himself. It's another win for the skipper. Barkley scored twice and Hudson-Odoi will have sparked excitement, but Sterling is perhaps the outstanding performer in this England team right now. It was his cross that found Barkley for the third and he then laid on the fourth for Kane before confidently finding the net himself to make it five. It was a brilliant performance and one that's becoming familiar. Southgate had been full of praise for Henderson in anticipation of his 50th England cap and the Liverpool midfielder duly came on for his landmark appearance in the second half. It was the ideal situation for Henderson and he enjoyed himself, joining in with the attacks as Montenegro become disjointed and playing a delightful through-ball for Sterling's goal. A late call-up to the squad, Ward-Prowse was rewarded for his fine form for Southampton by getting a run-out in place of Barkley. His last appearance for England had come in 2017. Bournemouth forward Callum Wilson was another who got to add to his collection of caps with the game won. He came on for Kane but didn't get to add to his one England goal.